The exterior of East High School. Former principal, others acted in "good faith" while police detective was deceptive, a ruling says. 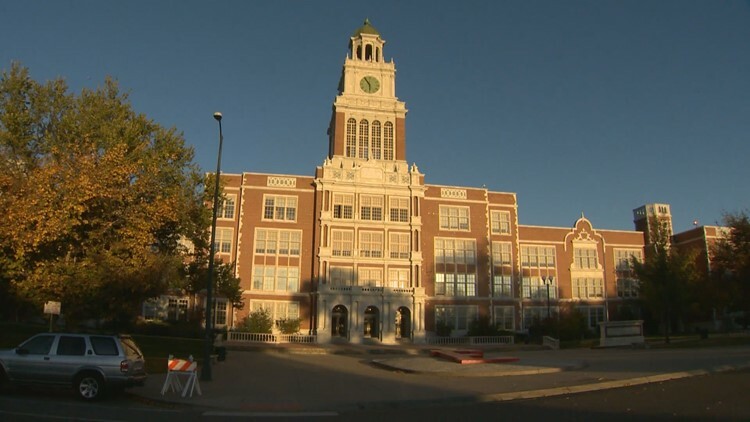 A Denver judge has dismissed criminal charges against four current and former administrators at East High School who had been accused of failing to call police after learning of a female student’s allegation she’d been sexually assaulted, 9Wants to Know has learned. Denver County Judge Gary M. Jackson concluded “that at all times the defendants were acting in good faith and carrying out their duties as school administrators” in their contacts with the girl and her parents, according to a copy of the sealed ruling obtained by 9Wants to Know. As a result, Jackson dismissed the charges against former East principal Andy Mendelsberg, former vice principal Jann Peterson, dean Eric Sinclair and counselor Anita Curtiss. Jackson also concluded that a Denver police detective used a “deceptive investigation technique” in the case. She pointed out that Jackson for giving extensive time to both sides in the case – he heard from 12 witnesses over two hearings held in November and December and considered 17 exhibits. "I have no doubt that if this case had gone to trial a jury would find in our clients' favor as well," said attorney Tiffany Jo Drahota, who represents Curtiss. Attorneys Marci LeBranche and Marshall Breit, who represent Sinclair and Peterson, respectively, declined to comment. The Denver District Attorney’s Office has 35 days to file an appeal. It is not clear whether it will – the office is prohibited from acknowledging that the case exists because it is sealed. The four were accused of repeatedly failing to call police after learning that a female East student had reported being inappropriately touched by a male classmate in March 2016. A judge had earlier dismissed a charge against a fifth East administrator after she argued successfully that in her case the statute of limitations had run out – something prosecutors are appealing. Mendelsberg, Peterson, Sinclair and Curtiss had each been charged with a misdemeanor count of failing to report suspected child abuse. Curtiss had faced an additional count, negligent child about without injury. Colorado law requires educators, doctors, pastors and a host of others to call police if they know, suspect or are told that a child has been abused. In court documents previously obtained by 9Wants to Know, Denver police and prosecutors disputed the assertion of district officials that the administrators had properly reported the allegation. The controversy started in March 2016 when a female East student told a dean that a male classmate had touched her inappropriately. As a result, “each is immunity from criminal prosecution and personal civil liability” under Colorado law. He also wrote that the detective working on the case did not reveal to any of the administrators that they were the subject of a criminal investigation. A message requesting comment from a department representative was not immediately returned Tuesday evening.